Take a walk on the wild side and experience a world of vibrant imagination, where art celebrates individuality through the eyes of Akron’s most exciting contemporary artists. This stunning exhibition opens at Summit Artspace Gallery on Friday, July 10, 2015 from 5-8pm and on view through Aug. 16, 2015. 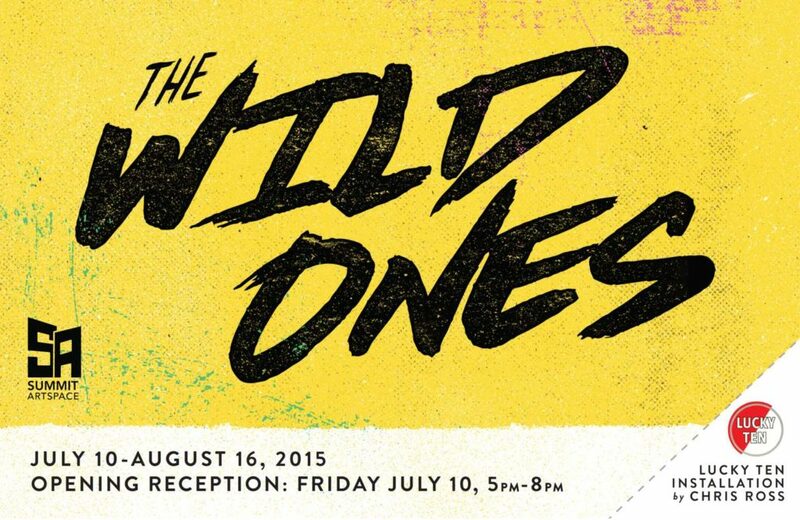 THE WILD ONES brings together strong and unique contemporary works exploring rebellion and its impact on American culture. The images invite the viewer on a journey to appreciate the icons, attitudes and personalities associated with the free spirits, forward thinkers and creative movers and shakers from American culture. Exquisite oil paintings, colorful pop-art inspired drawings and meticulous craftsmanship encompass this compelling exhibition. With over 20 participating artists such as college professors, illustrators, graffiti artists, graphic designers and tattoo artists, each shares his or her personal connection to the evolution of forward thinkers and those who have brilliantly been ahead of the curve in both style and content. Summit Artspace is excited to announce a special installation of Chris Ross’ Lucky Ten Series within THE WILD ONES exhibition. This lively series creates social commentary on advertising, graffiti and popular culture. The body of work has taken over four years to complete with more than 100 unique works on display. You have to see it to believe! Contemporary works exploring rebellion and its impact on American culture. RESIST: Exploring Texture at Summit Artspace, Saturday, July 25, 1 pm, FREE This workshop is an introduction to using resist printing techniques which can be used to create a wide variety of textures. This class is free, kid-friendly and open to the public. Jennifer Davis of smART Studio is the instructor for this exciting workshop. Limited to 20 students. Online registration is required. Register here.